This feature allows the user to control whether the customer sales period-to-date and year-to-date are updated when a debit memo is posted from Sales & Cr/Dr Memo processing. This feature is enabled through a new A/R Global Setup flag 24. 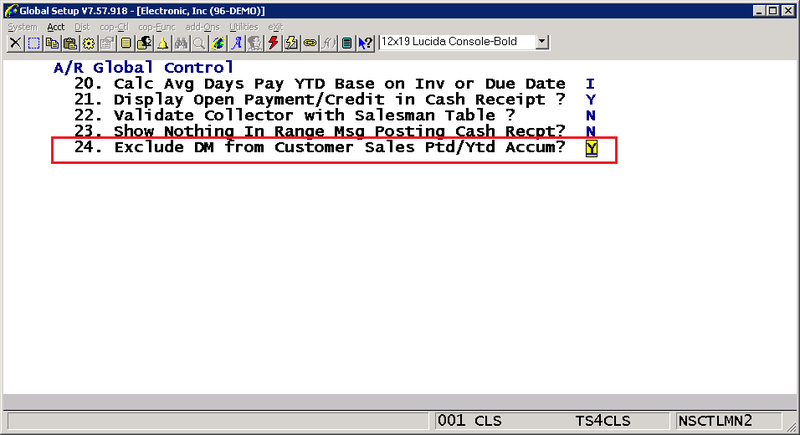 Exclude DM from Customer Sales Ptd/Ytd Accum? 24. 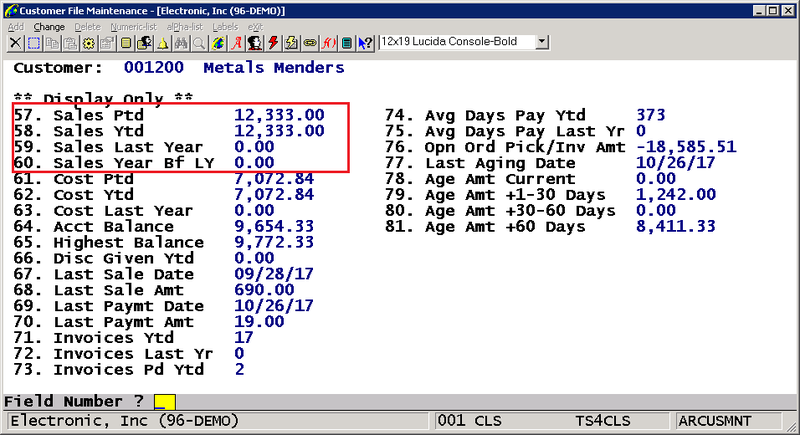 Exclude DM from Customer Sales Ptd/Ytd Accum? - The default value is N. If set to Y, the customer sales period-to-date and customer sales year-to-date fields will not be updated when a debit memo is posted. This will also affect the sales last year and sales year before last year when the year end closing is run. When posting cash receipts with a charge back, the debit memo that is created will not update the sales period-to-date or year-to-date regardless of the new Global Setup option. When running COP-> Util-Setup-> Reset Cust Sales/Cost the program only considers invoices in the Invoice History file. It does not include any debit memos from the A/R Open Item file when recalculating the sales period-to-date or year-to-date.